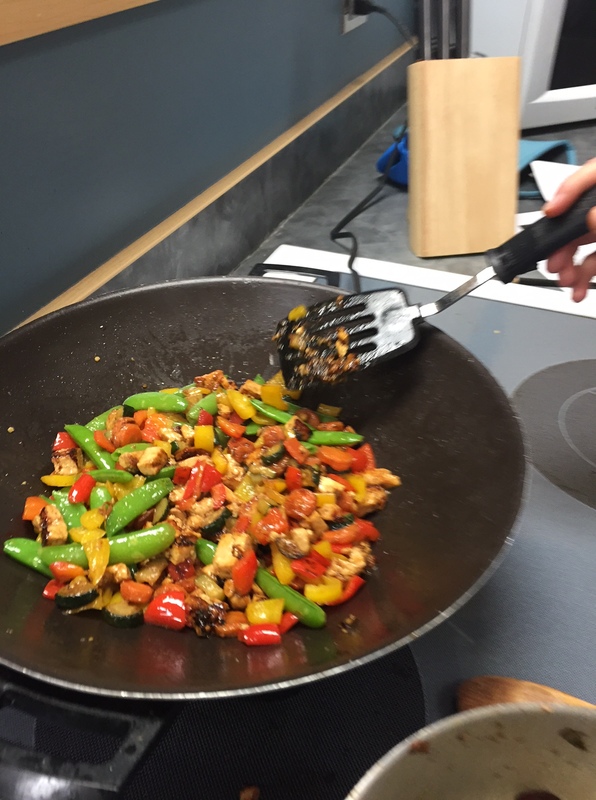 One of the young chefs poked the tofu that was resting on the table for the stir-fry we were making that day. It giggled under his touch and then returned to form. In our small groups, the volunteers cut up a few little pieces off of the uncooked tofu and handed them out to be sampled. Almost none of the young chefs had ever heard of tofu much less tried it. As they were getting ready to eat the pieces we explained how tofu is made out of soybeans and is a staple in Asian cooking. The reactions varied from bad to worse. One of the students ate it with only a slight grimace while another ran to the closest trashcan and spat the tofu out in theatrical fashion. Before we broke into small groups, everyone gathered around the main counter to watch the day’s demonstration. The volunteers set up a container filled with water and poured a couple tablespoons of soy sauce in. Then they added some clear Jello into the container and asked the students what they thought would happen. They were quick to hypothesize that the Jello would start to darken as the soy water infused into it. The demonstration was a great way to start teaching the young chefs about the process of diffusion, in which molecules will travel from an area of high concentration into one of low concentration in order to reach equilibrium. In this case it was the soy into the Jello, in the case of our stir-fry it would be the marinade diffusing into the tofu. In the small groups, the young chefs chose a marinade to prepare. One group chose soy-ginger, another chose ginger-orange, and the last chose barbeque. After making the marinade they placed pieces of the tofu to soak. Then the chefs cut up some fresh vegetables (carrots, peppers, snap peas, onions), sautéed them until they were cooked and then added the tofu.